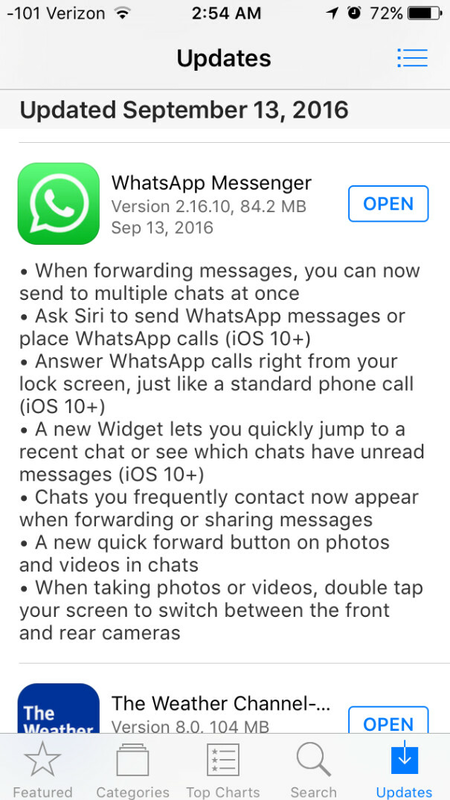 An update to version 2.16.10 of WhatsApp for iOS adds a number of new features for those with an iPhone or iPad running on iOS 10. The update weighs in at 84.2 MB, and is available from the App Store. With the update, iOS users can now ask Siri to place a phone call through WhatsApp, or send a WhatsApp message. And like a standard phone call, the update allows users to answer a WhatsApp call directly from the lockscreen. Similar to a new feature that made it to the beta version of WhatsApp for Windows Phone, iOS users will be able to quickly forward photos and videos to WhatsApp contacts when in chats. In addition, a new widget allows users to jump to a recent chat, or see which chats have unread messages. Forwarding messages can be sent to multiple apps at once; when forwarding or sharing messages, chats frequently contacted will now appear. And there is one last change. When taking a photo or video, double tapping on the screen will switch the camera in use from the rear-facing snapper to the front-facing one, and vice versa. To see if you have received the latest version of WhatsApp, open the App Store and click on updates. Scroll down until you see WhatsApp. If the rectangle next to the name of the app reads "open," your iPhone or iPad might have already updated the app. Look to see which version number has been installed last on your iDevice. If it says 2.16.10, you don't need to do anything. If the rectangle reads "Update," click on it to update the app. In the unlikely event the rectangle reads "Open" and the version listed is older than 2.16.10, you need to wait for the update to hit your phone. If it doesn't after a few days, you might want to contact Apple. Mmmm, is WhatsApp available for iPad?